Tarte Lights, Camera, Lashes Mascara! Yes, that’s the name of it…kind of awesome, right? 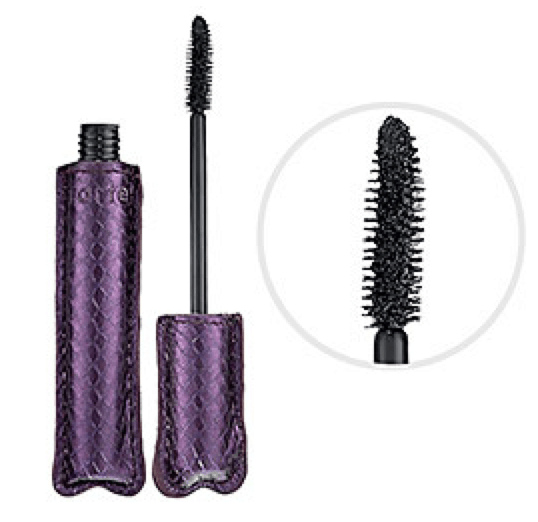 Well that’s not all that’s awesome about this mascara…the way it makes your lashes look is aaahhhhmazing!! Tarte is another brand that is made of all natural products. It doesn’t include any of those bad endocrine-altering ingredients (phthalates, BPA, triclosan, etc), and has some really great ingredients that give you an all-over awesome look. Did I also mention that it has olive esters in it to help condition and protect your lashes too? One thing that’s really important to me in a mascara (besides the ingredients) is the way that it goes on. Yes the brush is what matters in the mascara, but the consistency as well. You know when you first get that tube of mascara, and its super runny when you put it on? Well I have NEVER had that issue with this mascara. It comes in this awesome purple snake-skin-looking case, and is really easy to open and close. The brush tip comes with a lot of bristles (which I really like) to help coat the mascara on evenly. You can find this at Sephora (and even try it there to see what I’m talkin about!) or directly from the Tarte website. It’s also found in tons of other beauty stores (the site will help you locate it). I was not compensated for this review. Nor was I provided this by Tarte. I purchased this on my own dime.